After examining thousands of maps of hundreds of subjects and events we found six distinct network structures in Twitter social networks. Each is profiled below. There is no doubt that there can be other styles and structures of social media networks remaining to discover. The landscape of social media remains a partially undiscovered and poorly mapped terrain. The six network types we describe are intended as initial examples of distinct forms, not as an exhaustive list of all possible forms. It is also important to note that these maps only cover Twitter. Similar structures may occur in similar types of social media services, but it might also be the case that different kinds of social media services may generate different structures of networks. Polarized Crowd social media networks feature at least two large dense groups that have little inter-connection or bridge between them. These networks are often focused on divisive topics and are especially likely to involve political content. The “#My2K” hashtag is a good example of this type of network structure. The data set for this visualization is available here. The hashtag “#My2K” was proposed by the White House on November 28, 2012 in the context of the ongoing budget conflict with congressional Republicans. The hashtag is intended to represent the “2K” or the estimated $2,000 in increased tax costs that the average U.S. household was facing unless Congress acted to head off an automatic tax increase. The President proposed this hashtag to rally Twitter supporters to press Congress to preserve the tax break. To understand what kind of crowd gathered around the “My2K” banner, we collected and analyzed a social media network graph that represents a network of 688 Twitter users who tweeted a message that mentioned “My2K” starting January 6th and ending on January 8th, 2013. There is a green edge, or connecting line, for each instance when someone in our sample who tweeted about “My2K” was also a follower of another person who used the term. Separately, there is also a blue edge if someone in our sample “replies-to” or “mentions” another Twitter user who has written about “my2K.” There is a self-loop edge for each tweet about “my2K” that is not a “replies-to” or “mentions.” We call these Twitter users “isolates” in these conversations because they are not connected to others. 1 Bridge: Most people in a Polarized Crowd are tied to others in the same group, who often share their views. There are rare users who have connections to other groups. In this case the user in the red circle is @YasserMohamed2, an Egyptian human rights activist, who has connections to Twitter users in both groups. 2 Liberal group: This group is dominated by references to liberal hashtags such as Occupy Wall Street and Progressives 2.0, and by liberal commentators such as @NHLABOR_NEWS and @Politics_PR. 3 Relatively few connections cross the divide to bridge between the groups. 4 Conservative group: This group is dominated by references to conservative hashtags such as #tcot (“top conservatives on Twitter”) and #tlot (“top libertarians on Twitter”), and by conservative commentators such as @DailyCaller, @TheTeaParty_net. 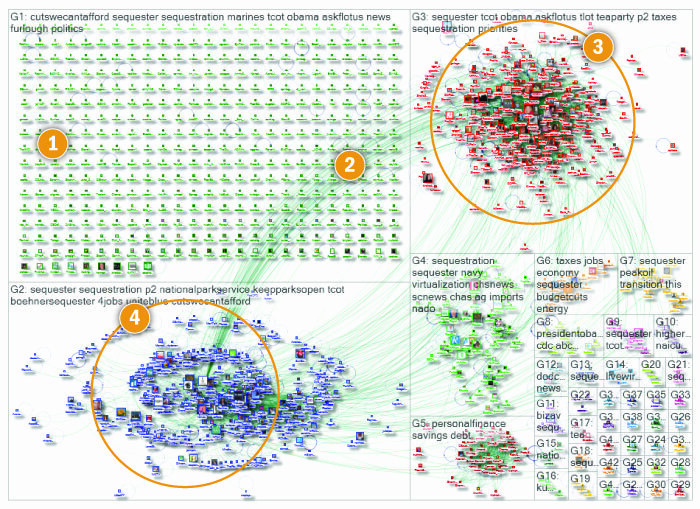 What it means: In the Polarized Crowd network map, two large dense groups of people talk about the same subject, but do not connect to each other or use the same words, URLs and other hashtags. There are few users who bridge connections between these groups. Few people who talk about this subject are “isolated” from others; most users are connected to at least a few others. The #My2K hashtag network map features two dense groups of Twitter users with very few connections between them, indicating that few people in one group replied to, mentioned, or followed people in the other group. Analysis of the content of the tweets created by the people in each group showed that the words, hashtags, and URLs mentioned in each group are very different despite the common topic of their tweets. In the network map each group is labeled with the ten most frequently mentioned hashtags used by the users in that group. The group on the left is a large dense group of 360 people who often added the hashtag “#tcot” (which stands for “Top Conservatives on Twitter”) and is often used by conservative Twitter users to self-identify with conservative politics. The group on the opposite side of the graph is composed of 254 people who often added hashtags like “#ows” (“Occupy Wall Street”) and “#p2” (“Progressives 2.0”) to their tweets, suggesting that they identify with progressive politics. 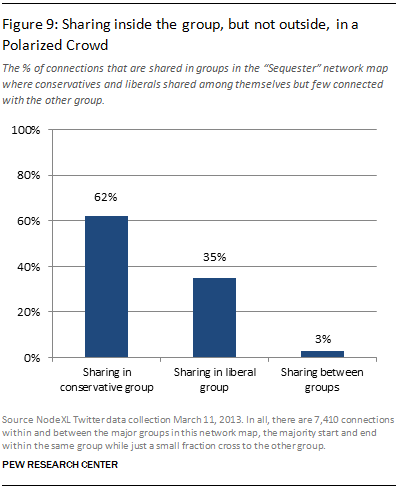 The network map illustrates that conservatives discussed the subject of “My2K” with one another and liberals discussed it among themselves, but few spoke to someone from the other group – or heard from someone in the other group. Outside of these major groups are smaller groups with just 74 people who have few connections to other users. Some 48 of them had no connections at all— these users are called “isolates” because they are not connected to anyone else in this particular Twitter conversation. These disconnected people mentioned the “#My2K” hashtag but were not observed to follow, reply, or mention anyone else who did so in this dataset. These may be people who are just starting to mention this topic and related political issues, since they lack connections to people who are already discussing the topic. In the middle of each of the two large groups are users who are “hubs”; people with many connections. In a Polarized Crowd network, these connections rarely span the divide to connect to people in other groups. Each group has a small number of highly central core participants. In the conservative-leaning Group 1, the most central people are: @DailyCaller, @TheTeaParty_net, @JC7109, @PeterMAbraham, @saramarietweets – all self-identified conservatives with considerable followings. In the liberal-leaning Group 2, the most central people are: @Politics_PR, @NHLABOR_NEWS, @PaulStewartII, @BODIESOFLIGHT, @CAFalk. The user @YasserMohamed2 stands out as a highly followed user (red icon) who bridges the right wing group and the left wing group. When the most frequently used hashtags in each group are contrasted, the topical focus and orientation each group displays is brought into focus – Figure 5 below. Figure 5: Top hashtags by frequency of mention for the two largest groups in the #MY2K Twitter network map. Similarly, the most frequently used URLs in the tweets in each group are an indicator of the kinds of web resources each group is interested in sharing. The comparison of the URLs used in Group 1 and Group 2 illustrate the contrast between their political orientations, as seen in Figure 6 below. Group 1 links to partisan news sites devoted to a conservative perspective. Group 2 links to mainstream and liberal news sites and services. The relative absence of connections between these groups shows that people who tweet about #My2K rarely follow, reply to, or mention anyone who is located in another group. Indeed, Figure 7 below contrasts the connections within and between groups, highlighting how few people in each group link to people in the other group. Some 46% of all the personal connections in the map are among those in the tight conservative group (G1) and 53% of the connections are in the tight liberal group (G2). Less than 1% of the connections are between people in the different groups. There were 13,341 different relationships (created by tweets that contained other users’ names or “follows” connections between two users) among those who used the hashtag #My2K from January 6-8, 2013. Figure 7 shows that only .65% (less than 1%) of connections crossed between the two groups. Most topic networks on Twitter do not look like a Polarized Crowd, but many political discussions are structured in this way. 1 Many isolate users with no connections indicate the topic is public and widely discussed. 2 Few connections cross the divide to bridge between the groups. 3 Conservative group: This group is dominated by references to conservative hashtags such as #tcot (“top conservatives on Twitter”) and #tlot (“top libertarians on Twitter”). 4 Liberal group: This group is dominated by references to liberal hashtags such as #p2, #nationalparkservice, and #keepparksopen. Automatic across the board budget cuts, called “sequestration,” were imposed on federal agencies in 2013 by the U.S. Congress. The topic of “sequestration” is a divisive political issue that generates a clearly Polarized Crowd structure in Twitter. The topic attracts a large number of people who appear in Group 1 who share the quality of having no visible connections to others. These “isolates” are an indication of the public quality of the topic – that is, many people have heard of the term even if they do not already follow or reply to others who also tweet about the topic. This is a common structure also found in Brand Cluster networks (Network Type 3). What makes this structure a Polarized Crowd is the relationship between the liberal-leaning group 2 and the conservative-leaning group 3. These are two large dense groups of people who are both tweeting about “Sequestration.” But while people in each group have many connections within their group, they have relatively few connections to people in the other group. The chart below (Figure 9) shows how the two groups are linked to one another. Only 3% of the links in the network cross between the two groups. Contrasted with other networks described below, particularly the Tight Crowd network structure, this level of inter-group connection is very low. The low level of interconnection is an indicator that these groups are socially isolated from one another, despite tweeting about the same topic. Another indicator of the divisions between these groups can be seen in a comparison of the URLs posted in the tweets created by people in each group – as seen in Figure 10 below. The URLs in Group 2 are critical of conservative positions or cite documents that describe the impact of sequester mandated budget cuts. In contrast, the URLs mentioned in Group 3 are critical of concerns that the budget cuts will have major consequences. They also link to concerns about immigration politics and cite criticism of the Administration. The differences between these groups are also reflected in the different hashtags most frequently used in the tweets from users in each group – Figure 11 below. While both groups used hashtags for “sequester” and “sequestration,” they otherwise use different labels in their tweets. Settings these terms aside, in Group 2, the “p2” (“Progressives 2.0”) hashtag is the most frequently used label, while in Group 3 “tcot” (“top conservatives on Twitter”) is most frequently used. Other Group 2 hashtags (“nationalparkservice” and “keepparksopen”) suggest a focus on the negative effects of budget cuts on national parks. In contrast, Group 3 is focused on “Obama,” “askflotus” (for questions directed at the First Lady of the United States), and tlot (“top libertarians on Twitter”). 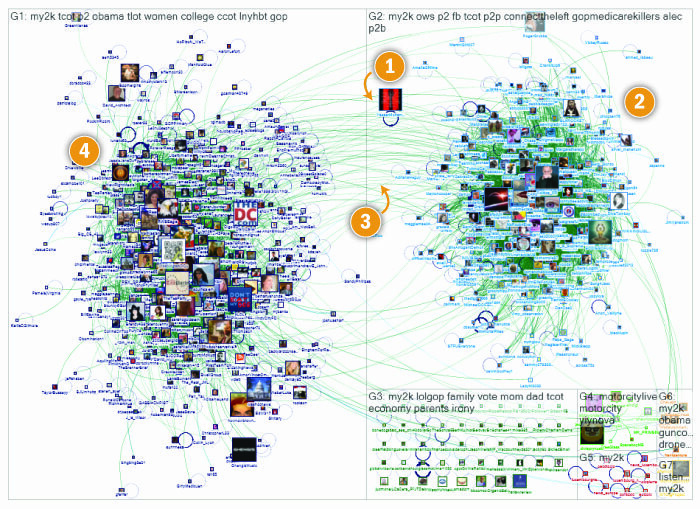 Many politically controversial topics display the Polarized Crowd network structure; these topics attract divided populations who converge on the same topic, term, or hashtag. For example, discussions about contraception often have a large dense but separate group that is opposed to legal access to birth control. But not all Twitter conversations have this form. There are many topics that have a network structure that is the opposite of the Polarized Crowd network structure. We call this the Tight Crowd network structure. Unlike Polarized Crowd network conversations, people in Tight Crowd networks have strong connections to one another and significant connections that bridge between any sub-groups. These dense networks are often communities of people who are aware of one another and converse often. These networks have many people who follow one another and reply to and mention one another. People who share a common interest and a common orientation to that interest often populate Tight Crowd networks. These networks are composed of a few dense and densely interconnected groups where conversations sometime swirl around, involving different people at different times. In the Tight Crowd network map there is no “other” group like those found in a Polarized Crowd network. Tight Crowd network conversations have few if any isolates – the people who have no connections to anyone else in the network. In network terms, isolates are people who use a hashtag or mention a topic, but have not been observed to follow, reply to, or mention anyone else who talked about the topic. Often, these are newcomers to the topic. 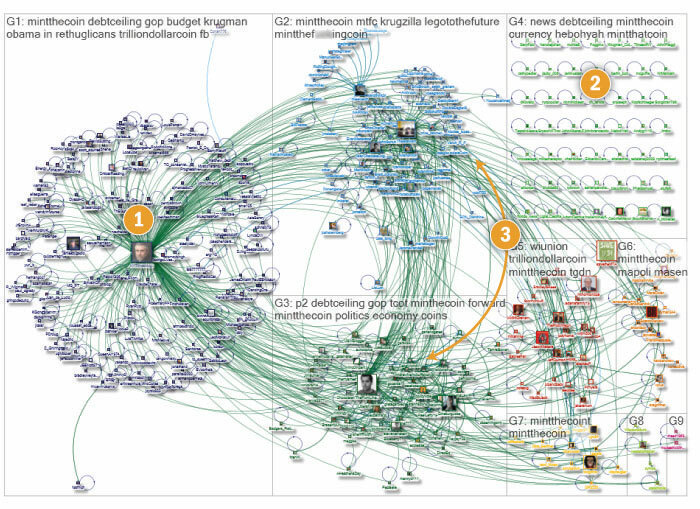 The #CMGRChat hashtag yields a good example of a Tight Crowd network conversation: https://nodexlgraphgallery.org/Pages/Graph.aspx?graphID=2434. The #CMGRChat hashtag is used by people who manage digital communities for their organizations. They are social media professionals who discuss and share resources about the best practices in running message boards, Facebook pages, and Twitter streams for their companies or non-profit groups. People who Tweet using the hashtag #CMGRChat form a kind of informal association of people who share an interest in digital community management. While some of these contributors have more connections than others, no participant in this discussion has zero connections and most have several. It often seems that “everyone knows everyone” in these dense network communities of connected participants. 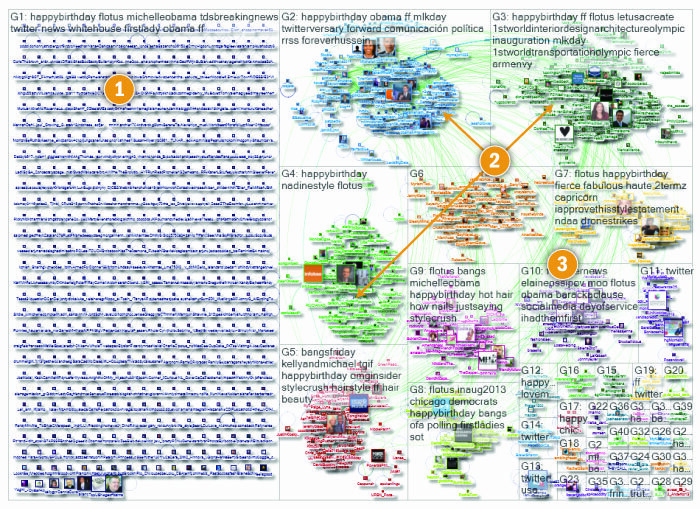 Figure 12 below is the network map of tweets using the hashtag #CMGRChat between January 14 and January 18, 2013. It shows a conversation divided into a few sub-groups with many connections bridging the divisions, suggesting these groups are more closely tied sub-communities rather than the divided, insulated, and separate communities found in the Polarized Crowd network structure. 1 The most frequently used hashtags in each group are used to label each group. 2 Internal connections within groups are dense. 3 Hubs are key people in strategic locations at the center of groups. 4 Groups are densely interconnected. 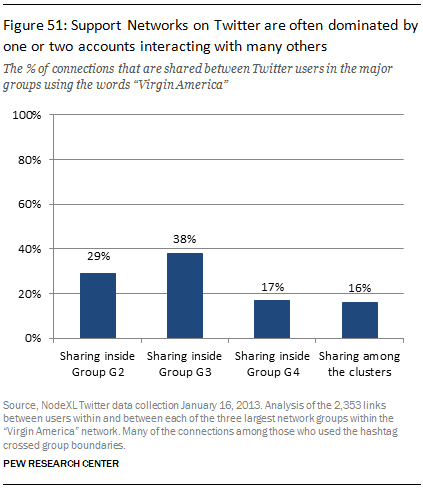 5 Very few users are “isolates” – most users link to at least one and often more others. What it means: Tight Crowd network community map illustrates high levels of internal connection—almost everyone in this network has multiple connections. There are few or no isolates—that is, users who tweet the hashtag but do not follow, mention, or reply to anyone else. Groups in the conversation emerge as Twitter users focus on different subtopics of interest to the community. In contrast to the Polarized Crowd network pattern, no large groups are isolated from each other in the Tight Crowd network. While the frequently mentioned URLs in each of the largest groups in the #CMGRChat network are different, there is little evidence of a divided focus as seen in a Polarized Crowd. Many of the URLs point to resources related to a range of social media related topics, but the topics are not in conflict with one another – See Figure 13. Figure 13: Contrasting URLs frequently used in the three large groups discussing #CMGRChat. A similar structure is found in the various hashtags that are more frequently used in each group in the #CMGRChat network. All of the groups mention the common terms #cmgr, #cmgrchat, and #smchat. Group 1 has a focus on the related chat hashtags, Group 2 has a focus on marketing, and Group 3 is focused on bloggers and search engine optimization (SEO) – Figure 14. Examination of the structures of linkage between groups in Figure 15 shows that there is significant cross connection, indicating the presence of a single community, rather than a divided Polarized Crowd. The #MLA13 hashtag, used in conjunction with the Modern Language Association conference, is another example of a Tight Crowd social media network. The Modern Language Association annual conference attracts many scholars who study culture and language. Like “#CMgrChat,” the “#MLA13” topic network in Twitter is a Tight Crowd with few isolates and a few small groups with significant interconnections. Figure 16 below is the network map that represents the connections among 599 Twitter users whose recent tweets contained “mla13.” The dataset for this file is available from: http://nodexlgraphgallery.org/Pages/Graph.aspx?graphID=2274. 1 Groups are densely connected with just a few peripheral low connection users. 2 All subgroups are densely inter-linked. 3 Only a few users are “isolates” – people who are not connected at all, but most are already densely connected to each other. This is a Tight Crowd structure because the people who tweeted the hashtag for this conference are highly likely to follow and reply to multiple other people who also mention the name of the conference. A relatively small group of the people who mentioned the event had no connections at all to the others talking about the conference. These “isolates” are an indication that news of the event was reaching new communities of people. 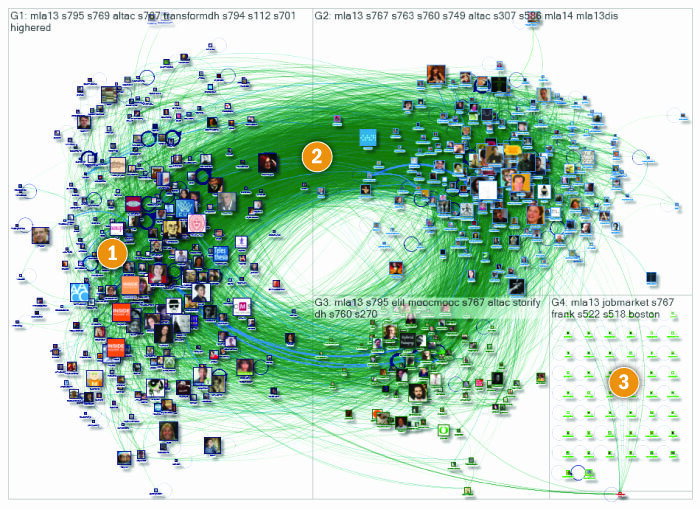 The dense connections among most people talking about “#MLA13” suggest that this is a Tight Crowd community. The use of hashtags and URLs in the content in each group is another way to contrast these groups. The most frequently mentioned URLs in the largest groups in the #MLA13 network are displayed in Figure 17. The overlap among these lists is an indication that groups share a common interest and referred to similar content. This is in contrast to networks in which there is little or no overlap in the URLs used in different groups, which would indicate polarization and division. In the #MLA13 network, all the sub groups linked to common articles on the InsideHighEd, Chronicle.com and Storify websites. The common use of content across these groups suggests that these networks are divided by small differences in social relationships and topic interest rather than major divisions. These groups are lobes of a common group rather than separate disconnected entities. The common focus between the groups in the MLA13 network is also reflected in the most frequently used hashtags as displayed in Figure 18 below. The top hashtags in each group refer to the conference sessions that people attended and Tweeted about. The sub-groups represent the sub-populations of people who attended different sessions at the conference. While session 767 was popular in all groups, each group also had at least one session hashtag that was unique to it. The connections people create can stay within their group or cross boundaries to connect to someone in another group. The measure of these intergroup connections reflects the Tight Crowd or Polarized Crowd character of a network. The rate of internal connection is plotted in Figure 19. The high level of cross group linkage is a strong indicator that the MLA13 network is a Tight Crowd network. Groups that use language in unique ways often create Tight Crowd networks. These topics share a common quality: People outside the group are often unlikely to know or use the term. Technical terms, hobbyist vocabulary, and professional events like conferences are all examples of topics that form Tight Crowd networks. These groups and clusters often form around topics that have limited general appeal but are topics of great interest to a small community. People who have a passionate interest in esoteric topics often find one another in social media. These people then often form multiple connections to one another as they share information about their niche interest. Therefore, a network map of a Tight Crowd community is a useful way to identify quickly the key people, topics, and URLS that are central to the discussion of that topic. People who tweet about brands and other public topics often form a network structure that is different from either the Tight Crowd or Polarized Crowd network communities. Brand Cluster networks often have very low density and many isolated participants. In a Brand Cluster network many people are likely to mention the brand without having any connection to other people who also mention the brand. Advertised products, public events, and major news events are likely to have this structure. All globally recognized firms have a distinctive structure of connection and conversation among the people who mention them. The Brand Clusters Twitter network map features large populations of people who have no ties at all to the others who are tweeting about the same subject. 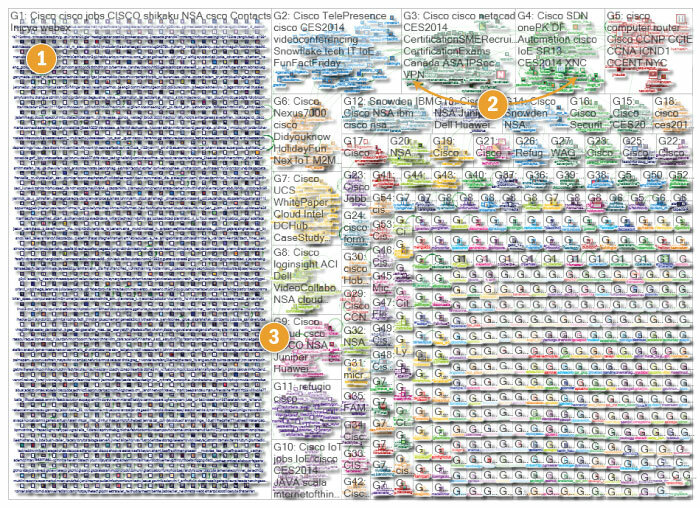 In the Apple Brand Clusters network in Figure 20, most users do not follow, reply to or mention any other user who also tweeted about Apple. A large proportion of users share the common attribute of having mentioned the Apple Brand name, but they lack any connection to one another. This network structure is common when a topic or term is widely known. Some small groups are present in a Brand Clusters network, visible in the upper right corner of the network in the map below. In this case, these groups are composed of small collections of users who discuss features and new releases of Apple devices with one another. 1 Brands have large numbers of disconnected contributors who mention the topic but do not link to one another. 2 Some small interconnected groups of users form around Brands. 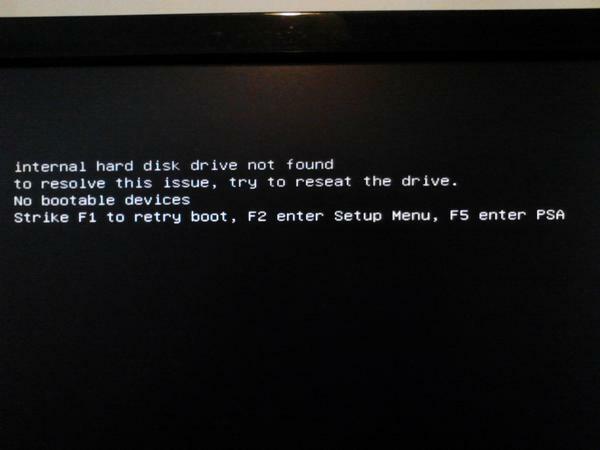 3 Subgroups have limited interconnection. In the Twitter networks that form around Brand Clusters, there is limited interaction between users and little overlap in terms of the content that is shared and the resources to which they link. None of the URLs frequently mentioned in each of the largest groups in the Apple network were mentioned in more than one group. This lack of URL overlap across groups suggests that the groups are distinct and focus on different aspects of the Apple product experience – Figure 21. Figure 21: Contrasting the most commonly used URLs in the five largest groups discussing #Apple. Users in each group also made use of different hashtags in their tweets. The table below displays the frequently mentioned hashtags in the largest groups in the Apple network. 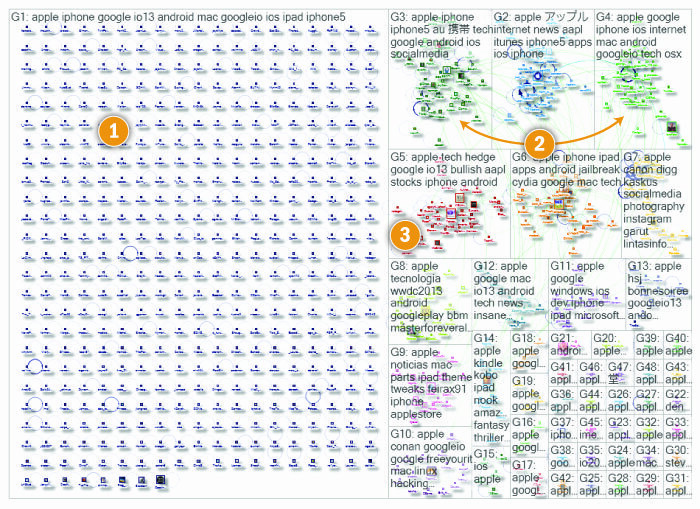 The different use of hashtags in each sub-group suggests that each group is devoted to a discussion of different aspects of Apple: Some discuss individual Apple products (iTunes, iPhone), others discuss investment in Apple, and still others compare Apple and Android mobile devices – Figure 22. 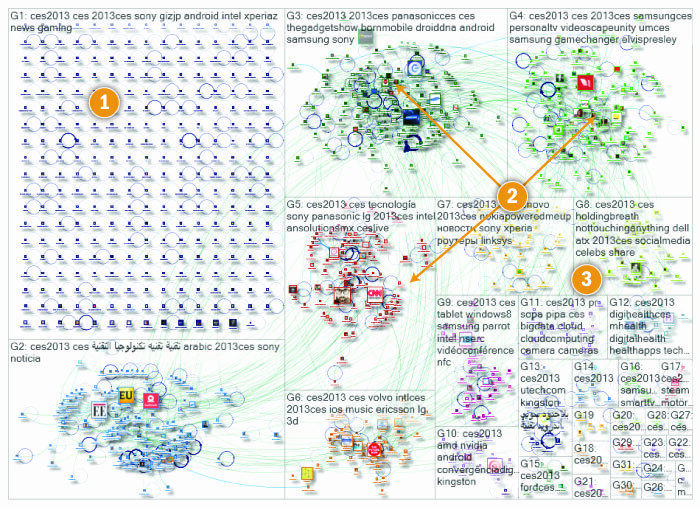 Mentions of Brands in Twitter generate Brand Cluster networks composed of many disconnected individuals and some small groups. 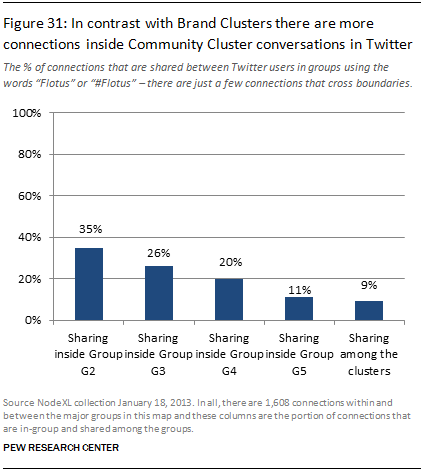 These groups are relatively interconnected, suggesting that Brand Cluster conversations in Twitter are not in the form of a Polarized Crowd. The rates of connections between groups discussing Apple in the figure below illustrate this limited level of interconnection – Figure 23. Cisco—another major brand that produces network technology that powers the internet—shares the Brand Clusters structure created by Apple. There is a large group of people that mentioned Cisco on Twitter, but they are largely disconnected from one another. In their conversations, these people all mention Cisco but do not connect to anyone else (see Figure 24 below). Alongside this large population of disconnected isolates, smaller clusters of connected users have formed in the Cisco Brand Clusters network. These small connected groups of people have few linkages to other groups. Analysis of the content in the messages in these groups shows that each group references a different set of URLs and hashtags. The URLs used in each of the largest connected groups are very distinct with limited overlap. This suggests each group was focused on different topics and interests related to the Cisco brand – Figure 25. Figure 25: Contrasting the most commonly used URLs in the largest groups discussing #cisco. The hashtags used in each of the largest groups in the Cisco network also illustrate the ways each group is focused on distinct topics and interests related to Cisco – Figure 26. The linkages between groups are sparse in this network – few people in one group mention the names of people in other groups – Figure 27. When groups of people in Twitter form networks with several evenly sized sub-groups, a structure different from the Brand Clusters network emerges. Community Clusters are the defining quality of these networks: they feature a collection of medium sized groups, rather than a crowd of mostly unconnected Twitter users. 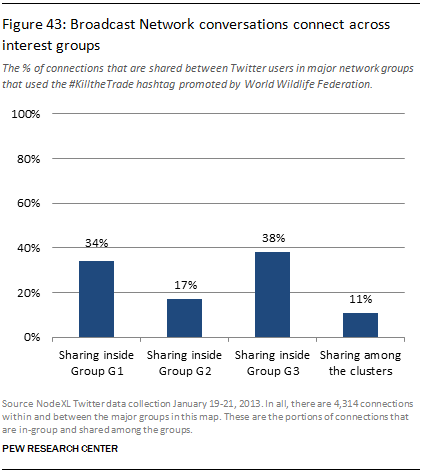 While many of the Twitter contributors in this discussion network are isolates, which demonstrates the Brand Clusters quality of this topic, there are also several densely connected groups of relatively equal size in a Community Clusters network. These types of social media networks have many hubs each with a separate crowd – in a sense, it can be compared to people clustering in different stalls at a bazaar. 1 Community Clusters have large numbers of disconnected contributors who mention the topic but do not link to one another. 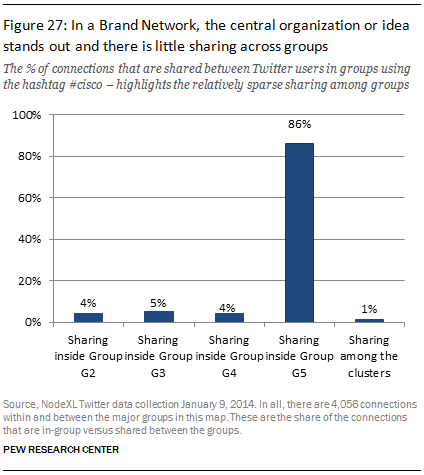 2 Bigger, more interconnected groups distinguish a Community Cluster conversation from a Brand. 3 Subgroups have heavier interconnections than in a Brand. There was more than the usual amount of social media activity related to Michelle Obama that day because the Obama Administration and activists were eager to create messages that mentioned her birthday and to generate attention for her work. At the same time, people made reference to the First Lady in different ways. Some mentioned her birthday, while others focused on the activities of President Obama’s allies. These topics are reflected in the different URLs that were cited in each group (Figure 29) and the different hashtags in each group (Figure 30). Figure 29: Contrasting URLs frequently used in the largest groups discussing Flotus. 1 Community Clusters can have large numbers of disconnected contributors who mention the topic but do not link to one another, just like in a Brand Clusters network. 2 In a Community Clusters network there are bigger, more interconnected groups than in the Brand Followers network pattern. 3 Subgroups have heavier levels of interconnection than found in Brand Clusters. The people tweeting in the groups in a Community Clusters network share a common topic but often have a very different focus. 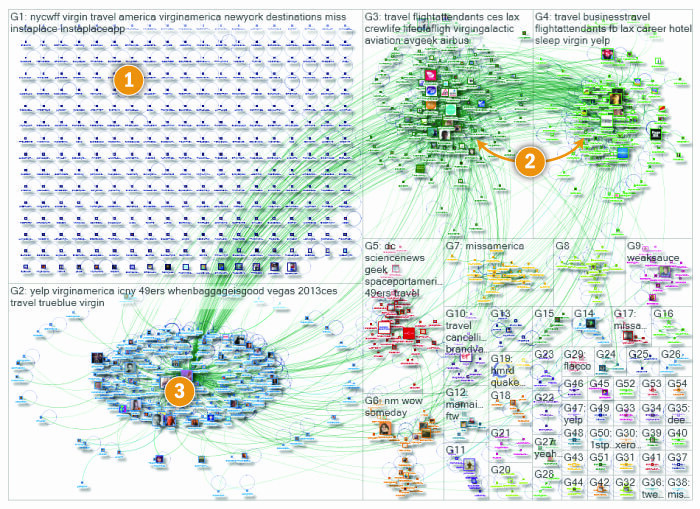 These networks are like conversational bazaars, where interests vary from stall to stall, as reflected in the contrasts between the most popular URLs in each cluster (Figure 33) and the different hashtags (Figure 34). Figure 33: Contrasting URLs frequently used in the largest groups discussing CES2013. * In Arabic, a variety of terms for the word “Technology”. 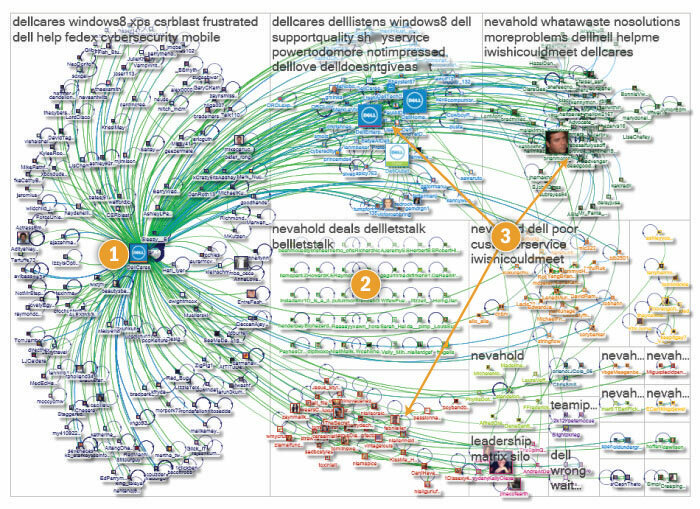 There is overlap among the groups in a Community Clusters style Twitter conversation. People in each cluster do not just link to and talk to people within their own group, they have at least modest levels of connection to people in other clusters, as shown by Figure 35. The Broadcast Network structure is dominated by a hub and spoke structure, with the hub often being a media outlet or prominent social media figure, surrounded by spokes of people who repeat the messages generated by the news organization or personality. An example is the conversation about New York Times columnist Paul Krugman’s article that appeared on January 11, 2013 – Figure 36 below. The op-ed piece criticized Republicans for their position in the ongoing debate over raising the debt ceiling. Krugman favorably discussed the idea that the U.S. Treasury Department should mint a $1 trillion platinum coin as a way to allow the government to continue borrowing money if there were no solution to the congressional stalemate. 1 Broadcast Networks feature a hub surrounded by many spokes, who retweet the hub’s material but do not connect to one another. They represent the audience for the broadcaster. 2 Isolates indicate the broadcaster’s message has visibility beyond the “regulars” who regularly repeat the broadcaster’s messages. 3 More densely interconnected groups are composed of small communities of interconnected people interested in discussing the hub of the Broadcast Network with one another. In this Broadcast Network there is an audience of people who are linked only to Krugman’s account. They are visible in Group 1. At the same time Group 2 and Group 3 contain denser collections of people who could be considered parts of different communities interested in discussing Krugman’s article with one another. The collection of isolates in group four suggests that the article was visible to a variety of people, even if they were not actively discussing it with other members of the Krugman discussion community or directly repeating Krugman himself. In Broadcast Networks, there is common use of central URLs – the content that is driving the Twitter chatter (Figure 37). Figure 37: Contrasting URLs frequently used in the largest groups discussing a New York Times article by Paul Krugman. * Links appearing only once were removed. Another hallmark of Broadcast Network maps is that Twitter users in different groups use similar hashtags and words – because their conversations start with the words and references of the broadcaster (Figure 38). There is some notable overlap among the groups, as seen in Figure 39, the bar chart below. At the center of the largest “#killthetrade” group is the account for the World Wildlife Foundation surrounded by a large number of participants who connect only to the WWF account. This is a low density hub-and-spoke group that contains the audience for the WWF. In contrast, Group 2 and Group 3 are communities composed of densely connected participants who all have many links to one another and are discussing the material tweeted around this subject. A Broadcast Network often has one or two large hubs with many spokes while the other groups are relatively small and internally densely connected. The groups in a Broadcast Network are often discussing the same information, according to the top links that are listed in each of the main groups. Figure 41 below shows this overlap. In the groups in a Broadcast Network there is often a similarity in the use of language, even if some of the common words in each group are not identical, as Figure 42 below shows. Figure 42: Top Hashtags by frequency of mention in the largest groups in the “#KillTheTrade” Twitter Network. 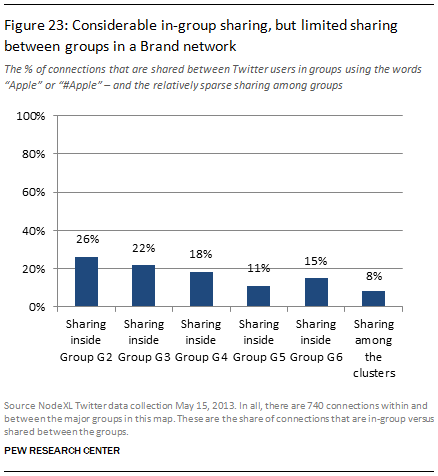 There is also a significant amount of sharing across groups (Figure 43). Many large companies provide customer support via Twitter, maintaining a user account to listen to and reply to user complaints and issues. This account is often set up to reply to whoever tweets about the company, especially when service issues are cited. In this Twitter Support Network structure, the central account reaches out to many other accounts, but those other accounts are not usually linked to one another directly. It is a structure built on outflow more than on in-bound conversation. 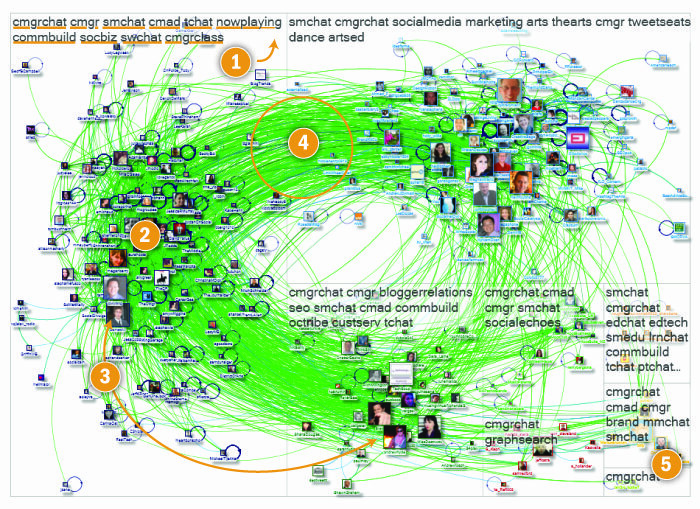 The map below (Figure 44) is an example of the Support Network conversational structure in Twitter. It examines those tweeting “DellListens” or “DellCares” – the names of two accounts run by computer manufacturer Dell to do customer support. The data for this map can be found at: https://nodexlgraphgallery.org/Pages/Graph.aspx?graphID=2956. 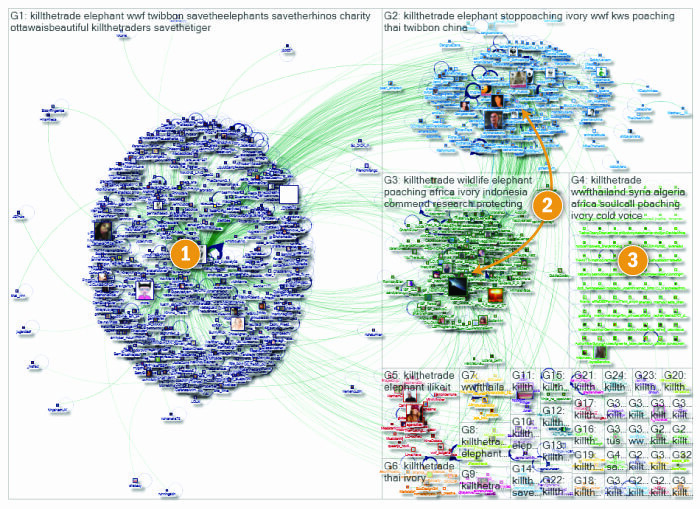 Among other things, it shows how dominant the central hub is in the Twitter conversation. That account is doing a lot of the talking and interacting with others. 1 A Support Network has a major group centered on a hub account, in this case DellCares , which connects to many spokes who each get a reply from the hub but do not connect to each other. 2 Isolates – users who have not been engaged with the support account (or any other account) even though they used the keyword phrases. 3 Small, dense groups are composed of interconnected users who interact with one another as well as the hub. They are having their own conversations about the Dell support center. The interactions in a Support Network have a hub-and-spoke structure with the hub’s outreach to others being the central structure. Figure 45 below shows that the URLs that are most commonly cited in the map are of the “show and tell” variety where instruction aimed at learning is a common theme. Twitter users frequently ask those at the center of Support Networks how to do things. Figure 45: The URLs frequently used in the largest groups discussing DellCares OR DellListens. * URLs mentioned only once were removed. In addition, some groups comment on the quality of their experiences with Dell computers and the quality of Dell products. 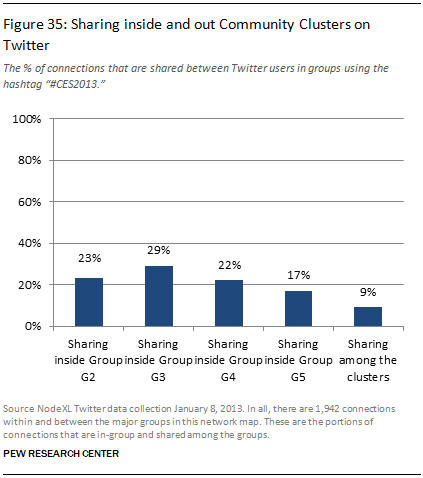 The table below (Figure 46) shows the most common hashtags mentioned by members of each cluster. 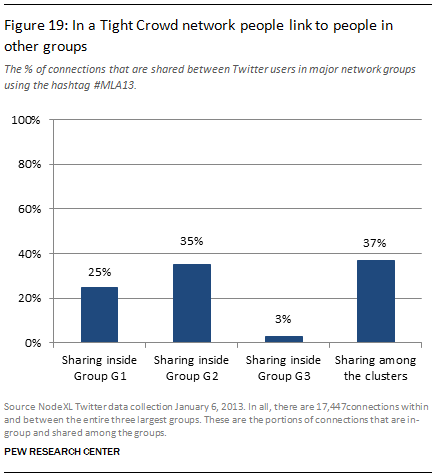 There is a modest level of sharing across the major groups as Figure 47 shows. Figure 46: Top Hashtags by frequency of mention in the largest groups in the DellCares OR DellListens Twitter Network. 1 Isolates are users who mention Virgin America but did not get a connection from the hub or any other user. 2 Denser groups link to the hub and to each other, focusing on industry news. 3 Support hub is surrounded by users who tweet customer complaints and receive replies from the Virgin America account. This network map illustrates a hybrid structure that has Brand Clusters features as well as an out-hub-and-spoke structure that is an indicator of a customer service account along with smaller community groups of densely connected industry analysts and journalists. This pattern resembles the Broadcast Network structure discussed earlier in this report. But it is distinguished by the high rates of mutual interactions between the hub account and the disconnected spokes of customers seeking travel assistance. The graph represents a network of 1,040 Twitter users whose recent tweets contained “Virgin America.” The tweets were made over the 7-day, 18-hour, 19-minute period from Wednesday, 09 January 2013 at 04:18 UTC to Wednesday, 16 January 2013 at 22:38 UTC. This map illustrates a hybrid network structure that has brand features and a hub-and-spoke structure that is an indicator of a customer service account along with smaller community groups of densely connected industry analysts and journalists. This structure resembles the broadcast network pattern discussed but is distinguished by the high rates of mutual interactions between the hub account and the disconnected spokes of customers seeking travel assistance. Figure 50: Top Hashtags by frequency of mention in the largest groups in the Virgin America Twitter Network.